Sri Lanka wasn’t new to Bryce Hutchesson when he took up his posting as High Commissioner for Australia in February 2016. 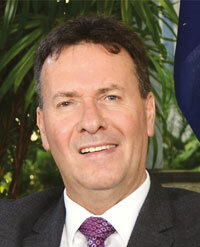 He had visited Sri Lanka in 2001 as the deputy of Australia’s New Delhi mission and later in 2013/14. For someone who is fascinated by this island, its green spaces, natural beauty and wonderful people, Sri Lanka received top priority when it was time for another overseas posting. Hutchesson holds both law and commerce degrees from the University of Melbourne. He has also served in Egypt, Thailand, Israel and Washington D.C. Together with his wife Elizabeth who also works in the Australian diplomatic service, he enjoys rest and recuperation travelling around Sri Lanka, taking in the freshness of the hill country and checking out the Cultural Triangle. In Colombo, he enjoys surveying its changing skyline from one of many rooftop bars. Q: How do you view Sri Lanka since taking up your posting? A: The pace of development in Colombo particularly around Slave Island and Galle Face has been rapid. Tourism has definitely grown, and there is recognition of the importance of effective and transparent governance in that industry. There has been modest progress on the ‘ethnic reconciliation’ front although more needs to be done. Some progress has also been made as regards establishing a sustainable economic policy, and economic reform that genuinely connects Sri Lanka with regional and international markets. However, the events that unfolded last October have put a question mark over what the future might hold for the country. Q: What are the latest developments between Australia and Sri Lanka? A: Year 2017 in particular was important for both countries as we celebrated 70 years of diplomatic relations and marked a period in terms of mutual engagement. A series of high-level visits included the first ever Sri Lankan head of state to visit Australia; the first purely bilateral visit by a Sri Lankan prime minister in many years; and the visits of the Australian prime minister, foreign minister and development ministers. 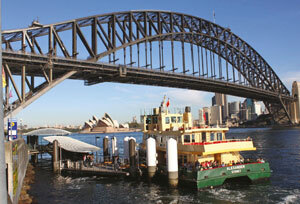 Education connections are burgeoning with Australia being the most sought after destination for undergraduates. We’re also witnessing more university research collaborations, staff exchanges, internships and long-term study opportunities here in Sri Lanka. And tourism links are strong with Australia being the second fastest growing market for Sri Lanka. Q: And what other projects are in the pipeline? A: The trade relationship is growing strongly as are development partnerships with Sri Lanka. There’s serious commitment in contributing to the development of policies and regulatory frameworks for skills training in the tourism industry. The expansion of the defence engagement particularly with the Sri Lanka Navy joining the Royal Australian Navy in multilateral naval exercises has been significant. In March, there will be a major Australian navy task force deployment on an Indian Ocean goodwill mission. Q: Looking ahead, what should our two countries be aware of globally? A: Being Indian Ocean neighbours, we’re witnessing a convergence of regional strategic interests. We maintain a strong focus on fostering a secure and stable region, in which relations between regional and extra-regional countries are governed by mutually understood norms and values. At a time when the world is changing more rapidly than before, it’s important to reinforce institutions, values and processes that have served us well, adhering to rules based international laws where large countries cannot automatically have their way with smaller nations. These rules and processes ensure equality and mutual respect. Q: In the medium term, what challenges do you foresee for both countries? A: Sustainability is the top challenge in the region and globally. This includes the impact of climate change on the agriculture sector, disaster response requirements, and the future resource and energy mix. There’s also the question of sustainability in various parts of our respective economies. For example, in Sri Lanka this will include ensuring a formula for sustainable tourism. Q: Where would you like to see Sri Lanka in 10 years’ time? A: More truly at peace with itself and its various communities – although history suggests that the coming together of communities won’t happen quickly. The people of goodwill everywhere in Sri Lanka must have the opportunity to bring others under that uniting umbrella to optimise the country’s potential. Being in a centrally important location, it makes sense for the nation to be open and engaged with the world, by using its location as a hub to engender genuine prosperity and connectivity. Q: How do you view Australia’s emerging role in the global trade and political equations? A: By any measure, given the size of our economy and military – as well as extensive natural resources – and as an education and lifestyle power, Australia is an important country. Founded on immigrants, it is the most successful ‘immigrant country’ in the world in terms of the harmonious integration of people from different parts of the world. As it doesn’t have a huge population, it can’t afford to be protectionist. Therefore, we must be connected to value and supply chains. We’re committed to multilateralism and are cognisant of its benefits.